And Happy Halloween to all of you guys! Hope you have a bloody, spooky and terrifying night! Muahahahahahaha! Yeah, it's very creative!! I wish we'd also have this tradition here. lmao! is that a pic you just found or is it your place or someone you know??? Sadly, it's not mine. But I just LOVE the idea. We don't have the whole pumpkin tradition here. Halloween is not very big in Europe. :( So, no pumpkins, decoration or trick or treating. MWHAHAHA. What a cool pic! 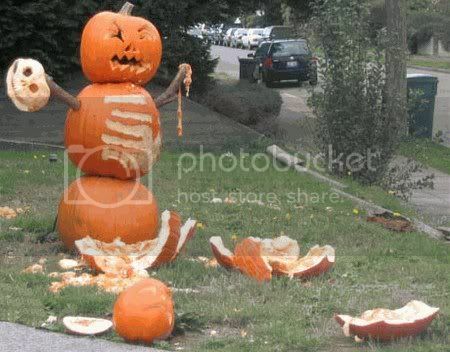 Did you make this pumpkinman or ...?